NEDbeads: Happy Happy Happy Nancy!!! Yes, I am dancing around and thrilled down to my shoe soles! I had the incredibly wonderful news yesterday that one of my necklaces has been juried into Lark's newest 500 series book, 500 Jewelry!! If you haven't checked this out already (how could you not, with beaders linking to it every which way on Facebook and blog alike?? ), make sure to go to Amazon or your nearest book store and earmark this book for your future purchase and enjoyment. 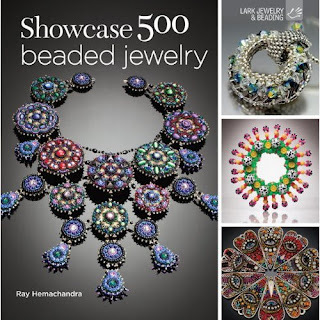 I am humbled and honored and amazed to be included in this compendium of wonderfully talented ladies and gentlemen of the beading world. Congratulations to everyone who juried in!!!!! My gratitude for this help and support then brought to mind how rampant thievery is affecting our beading communities. At nearly the same second I got my notification of acceptance, it was posted online that one of Sue Horine's amazing pieces of art had been stolen right out of her shop. All month long, there have been people finding more and more of their patterns, tutorials or designs being flagrantly copied or sold without their permission, design credits not given... on and on. 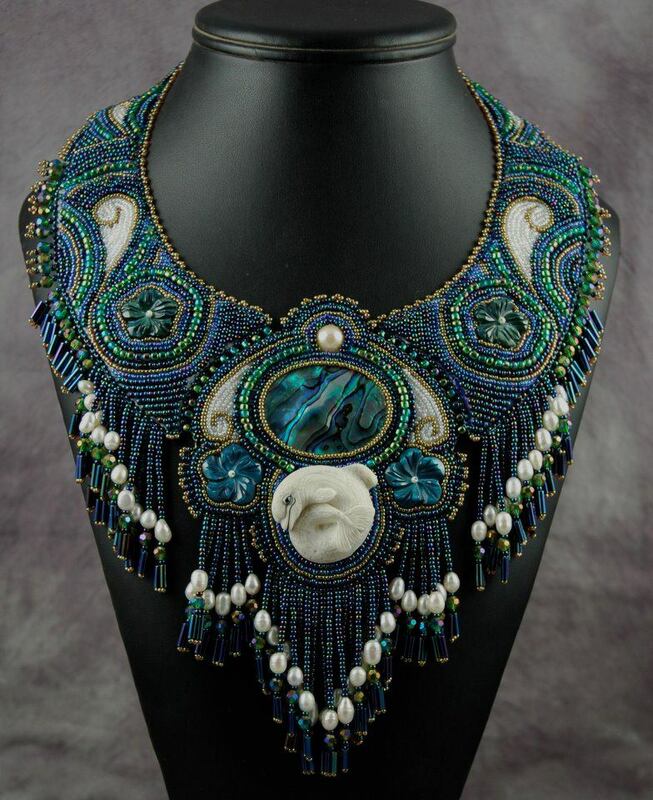 Let me explain how the one leads to the other in my (decidedly odd) head: Without the support and generosity of my friends, and my fellow beaders, especially those who were quite well known, I could not have learned enough about beading to make a go of anything I made. Several of these beaders were kind enough to teach me things free of cost, so that I could advance myself through stitches or projects that would show me tension or needle control, or how to get those beads to line up the right way. Some of the teaching included tutorials and/or patterns that they normally had for sale, and would have sold me; they certainly didn't have to give them to me. These same people could most certainly at least hesitate in our current environment of thievery, to share the same things they shared without a qualm years ago, and I wouldn't blame them in the least. Giving something freely, or having it forcibly wrested from you... I worry that with all of the stealing and underhanded dealing going on, that we may, as a community, start to withhold the knowledge we have in our attempts to stem the tide. I have attempted to pay it forward always; to teach anything I know (within reason) freely, to share techniques and stitches and tips and tricks... and I will keep on doing so, and most of the beaders I know will, as well. 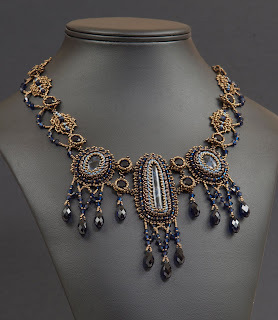 But there is only so much that the designers as a whole will take, and it frustrates me to know that the thieves will eventually make it very hard for the beginning bead artist to get where they need to go. congratulations!!! the necklace is STUNNING!!!! Thank you so much, Triz! SQUEEEEEEEEEEEEEE!!! One foot hoppin happy dance! I am one of those who you have paid it forward to and for that I am grateful beyond words. I also feel the same as you and hurt for my favorite designers as well as anyone who wants to break into designing. The current stealing and copying is just plain wrong! Thank you for trusting me with your inspiration and support. Thank you, K, and of COURSE I trust you, silly lady!! Congratulations Nancy - very well deserved - I have always admired your work. Congratulations Nancy. So happy for you! Congratulations Nancy. I love your aesthetic, and I can't wait to smell the pages of a brand new, beautifully printed book the next time I see your glorious necklace. Yippee!!! Thank you, Jin, you're an inspiration yourself, always. This is so great for not just for you but for all of us who love you and are in awe of your talent. I want to buy the book now just because you're in it! I completely agree with you about the problems w/ thieves and copyright violations. It's so sad to see such unethical, immoral doings. It makes me appreciate you all the more because you DO pay it forward and I'm so impressed by that. You are one awesome beader but also one really good person. Thank you so much! I can't tell you all how excited I am!!! Congrats Girl! You rock, and I can't wait to get the book and admire your necklaces close up. YAY NANCY!!!!! I am so happy for you, you deserve it, oh yes you do! And - just as wonderful people like you eventually get what you deserve, so will those who steal. Although I know that there are some beaders who have decided not to share any more, most still do. We're not going to let the bad ones determine what we do, right? Thank you, Cynthia!! And you are SO right!! Many many congrats on the book, Nancy. Both the necklace and the photo are beautiful. As for the stealing, I guess we just have to keep on keepin on.If you think about it too much, it can really get you down and even paranoid. But it seems for every bad experience, something good happens to balance it out. Lets just concentrate on the good!! Congrats again on the good! Nancy, congratulations :) I´m so happy for you! And the new necklace is fantastic! YAY!!!! Congrats and well deserved beautiful talented lady!!! Mine is on order and can't wait to see it!! Thank you, Julie! 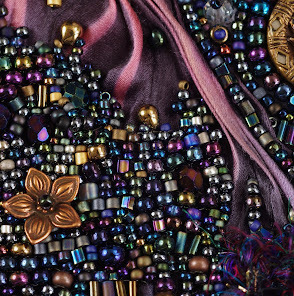 I can't wait to see it, either - there are so many of my beading heroes in there!!! The necklace is stunning! Congrats! Congratulations well and richly deserved, Nancy! Your work is exquisite! Can't wait to see the book!! Thank you so very much, that means the world and more to me. I SO hope that your feelings are widespread, and that most people DO feel that way!!!! Congrats Nancy...you deserve being in this book...you have shared with me & I share with others to make our Art flourish on and on. Woohoooo! Congratulations Nancy. I'm not surprised your lovely necklace is going to be in the book. Its gorgeous. I shall pop over to amazon in a min and add it to my wish list! Regency is amazing! So happy for you having it featured in Showcase 500 - congratulations; your work is so inspiring. Congratulations Nancy, although well deserved and no surprise! That's amazing news, and truly well-deserved! Congratulations Nancy, I am so happy for you, I can't wait to get the book and see all the fabulous work. It is such a shame that that beautiful necklace has been stolen, it is truly a work of art.